There’s some cool things in store for this month. And we are going kick off the holiday weekend with an important announcement on Thursday. We will keep up that momentum through the whole month with a new release (or re-release) almost every single week. On top of that there are new articles and videos coming. To hold you over here’s a new question from Ross. I don’t know where you heard this but it’s something that I’ve never have. And it’s definitely a myth. Be careful any time you assume something. You know what that does, right? If you look at it logically you’ll find the only thing that could stop you from learning is in your mind. There is no physical aspect that occurs at what, say 9 years old or maybe its 13, where its too late for you to become a good balancer. Sure there is benefits to being young in regards to balancing. They have many more years to practice. Plus their mind is much less likely to get in the way. I tell you what’s true though. If you believe you’ll never be able to hold a one-hand handstand than you definitely won’t. The same holds true for anything in life. Don’t believe you can learn a new language or to play a musical instrument. Then you won’t make the effort and you won’t reap the rewards. P.S. 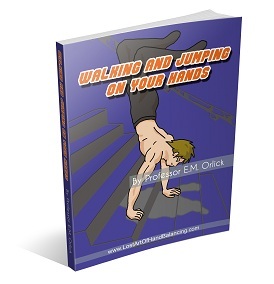 If you do want to learn the One Handed Handstand, you need a plan of action and that plan can be found here.